The 2013 Lexus IS350 is a great car so it is hard to believe that the redesigned 2014 Lexus IS350 is significantly improved but after spending a few hours driving the two Japanese luxo-sport sedans head to head – it is clear that Lexus has done a masterful job of improving an already very good option in the small luxury sedan segment. It can be hard to drive two cars in the confines of normal daily driving and be able to tell which is better so to give us the best chance to really experience the capabilities of the 2014 Lexus IS350, Lexus invited us to head out to Michigan International Speedway to test the whole 2014 IS lineup in a closed circuit environment. In addition to the new IS lineup, Lexus brought out a current (2013) IS350 AWD and the comparison was staggering. Even though I knew that there had been vast changes inside, outside and under the car, I was not prepared for just how much the company has improved on their popular IS sedan. Considering that we had the 2013 IS350 and the 2014 IS350, it seemed fitting to put the two head to head in order to pick out the changes – which wasn’t very hard after just a few laps on the road course. I should start by saying that I have liked the Lexus IS lineup since being introduced back in 1998 and Ive enjoyed my time in the 2013 Lexus IS350. I went into my test session expecting that the 2014 Lexus IS350 would be improved – after all, that is why they issue new models. However, I was ill prepared for just how much Lexus had improved their “entry level” compact sport sedan. The 2014 Lexus IS350 (shown here wearing the F Sport package) has been entirely redesigned on the outside with a look that is vastly more aggressive than the previous generation IS and this new exterior begins with the sportiest application of the signature Lexus spindle grille. The F Sport package adds gloss black mesh grille filler with a chrome trim piece and the floating Lexus logo in the upper portion. This grille is flanked by a set of LED driving lights that are separate of the headlight assemblies and that creates a great, super aggressive look across the front end. The slim headlight housings with LED lighting assemblies further the aggressive design while providing a high tech, upscale look. The F Sport package also adds a unique front fascia that is much bolder than the non-F Sport models but even without the F Sport package – the front end of the 2014 Lexus IS350 is far sportier and more aggressive than the current models. The emphasis on sporty design continues out back where the 2014 IS350 wears sharp, angular LED filled taillights with the L design that is featured elsewhere in the modern Lexus lineup. The 2014 Lexus IS350 is wider, longer and lower than the 2013 IS350 so even though some of the design cues (like the bulging hood design) is carried over to the new models, the overall design of the new Lexus is just as sporty as any other option in the compact luxury sport sedan while presenting a look that is a huge improvement on an already great car. The cabin of the 2014 Lexus IS350 benefits from the larger dimensions of the new sedan with more leg room for both front and rear passengers. When you are seated in the 2014 IS350 F Sport, the amount of available space for front and rear riders makes the IS feel more like a midsized sedan than a compact and in fine Lexus fashion – the interior of the F Sport is packed with just about every option that you would expect out of a new luxury sport sedan. This includes a premium infotainment package featuring the Lexus Enform connectivity system and a high end Mark Levinson sound system, all of which is controlled by the computer mouse like control system mounted just past the end of the driver’s center arm rest. The Lexus infotainment control is (in my opinion) one of the best in the industry so it is a welcome addition to the interior of the Lexus IS. Another exciting addition is the sliding gauge cluster of the F sport package that was borrowed from the high performance LFA supercar. This gauge setup allows the driver to center the tachometer and the digital speedometer between only essential gauges (temperature, fuel level) but with the push of a button on the steering wheel, the tachometer slides to the right and reveals a TFT display that contains vehicle information, navigation readout and sound system information. Of course, you also get all of the expected gadgetry like dual zone climate controls and heated seats along with plenty of plush premium leather on the door panels, dash and on the sport inspired seats. One of the key changes to the 2014 Lexus IS350 is the seating position of the driver – which is some 20mm lower (almost an inch) than the position of the 2013 IS. That doesn’t sound like much but when you go back and forth between the 2013 and 2014 model year IS sedans, there is a massive contrast in the seating position. The 2014 IS350 gives you a low slung feeling that you would more likely expect from a sports car than a small luxury sedan but after spending time driving the new IS, the seating position in the 2013 model year IS leaves you trying to figure out why you are sitting so high. You wouldn’t think that something as simple as lowering the natural seating position would make a big difference but for the 2014 Lexus IS350, dropping the driver’s seat bolsters the sporty feel of this roomy compact sedan. Between the heavy influx of high tech infotainment gadgets and the sportier seating positions, the 2014 Lexus IS350 is a car that will make a luxury sports car driver feel right at home while driving a sedan that has ample room for four adults. The 2013 Lexus IS350 interior was very nice but by comparison, the 2014 Lexus IS350 is a grand slam in the compact luxury sedan segment. The 2014 Lexus IS350 F Sport is powered by the same 3.5L V6 as the 2013 Lexus IS350 models with the same power output of 306 horsepower and 276ln-ft of torque so in terms of acceleration, the 2013 and 2014 models feel very much the same. Where the two really differ in terms of driving excitement is in their handling capacities as the 2014 IS350 features the Drive Mode Select system that was previously unavailable on the IS350 but this has been a feature that I loved in the new GS and LS models. Not surprisingly, this adjustable drive system paired with variable steering and a self-adjusting suspension system allows the 2014 IS350 to handle leaps and bounds better than the 2013 IS350. Our test course included a variety of different types of turns including a tight slalom, shorter tight turns and longer sweeping turns and in every situation, the 2014 IS350 felt far more planted than did the 2013 model. In a situation as simple as a 35-40mph slalom, the 2014 Lexus IS350 F Sport effortlessly weaved through the cones without much fuss while the 2013 IS350 at the same speed was quick to kick the back end out if you got too rough with the steering wheel or the accelerator. In the higher speed yet smaller turns, the 2014 IS350 performed like it was on a rail and the only way that you could get the car sliding is if you hit the turn with the intention of sliding while the 2013 IS350, on the other hand, kept me (and the stability control system) busy making sure that the back end stayed where it belonged. 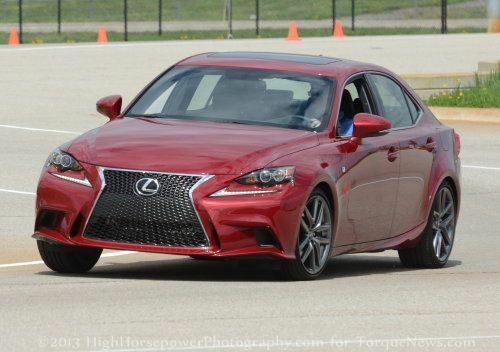 Finally, on longer, sweeping turns where the 2013 IS350 F Sport was able to continuously accelerate, pushing the 2013 IS350 to those speeds quickly sent the car sliding towards the outer barriers of the road course. In short, the 2014 IS350 F Sport felt better in every situation when pitted head to head with the 2013 model in a high performance setting. Even when I did not use the Sport+ setting that is specific to the F Sport package, the Sport drive mode offered handling capabilities that blew away the outgoing model. Best of all, when we took the 2014 IS350 F Sport out into the real world for some more reasonable on-road testing, the new Lexus was just as smooth as you would expect from a modern luxury sedan so while the company has designed a compact luxury sedan that offers real sports car handling – they have done so without hurting ride quality. When a new version of a popular car hits the market, the automaker responsible for this new car will often go out of their way to talk up new options, features or capabilities that might end up not being all that they are cracked up to be but with the 2014 Lexus IS350 – all of the talk from Lexus about the new model is far from fluff. The new IS350 has an uber aggressive exterior design that is fitting of both the Lexus brand and the segment as a whole while the premium interior setting provides a proper luxury layout with every modern comfort that you could ask for and tons of high tech goodies. Finally, the Drive Mode Selector can adjust the shift characteristics of the transmission, the stiffness of the suspension and the aggressiveness of the steering system to allow for a smooth comfortable ride in one mode and the feel of a modern sports car in another with the turn of a knob. My short time in the 2014 Lexus IS350 was an eye opening experience as the Japanese automaker has clearly put together a laundry list of changes that have made the new IS much better than an already very good IS sedan. The 2014 IS350 F Sport blew me away and I cannot wait to spend more time with this redesigned compact luxury sport sedan. This is truly a car worth the fuss.